downloadable informational flyer (double-sided) was shared around the community. OPB’s Think Out Loud” program included an interview of Oregon’s only female governor, Barbara Roberts, and Century of Action’s Eliza Canty-Jones, discussing the centennial and the past, present, and future of women’s political power. November 5, 2012: “The Suffragists: an Oregon Experience” OPB-TV; The premiere, with a special bonus segment at the end about Suffragist Abigail Scott Duniway. October 1 – October 8, 2012: http://oregondaysofculture.org/”>May 29, 2012: ” Oregon Days Of Culture “ at various locations around Oregon. Oregon Days of Culture celebrates the role of the arts, humanities, and heritage in our everyday lives. Participate by attending any number of events around the state. at Portland Community College Campuses: Cascade, Sylvania and Rock Creek. Exhibit includes original documents from the Archives holdings, including the original proclamation declaring the passage of women’s suffrage written by Abigail Scott Duniway and her 1913 voter’s registration card. Duniway, Abigail Scott. Path breaking; An Autobiographical History of the Equal Suffrage Movement in Pacific Coast States. James, Kerns & Abbott Co., 1914. Vault 324.3 D921p. The New Northwest (Portland, Or. ), 1871-1887, edited by Abigail Scott Duniway. Oregon voter: magazine of citizenship – for busy men and women. The Pacific Empire (Portland, Or. ) 1895-1898, edited by Abigail Scott Duniway. The Woman’s Journal (Boston, Mass. ), 1870-1912 [scattered issues from 1912 held]; continued as Woman’s Journal and Suffrage News (Boston, Mass. ), 1912-1916 [scattered issues from 1912-1914 held]. The woman’s tribune, (Beatrice, Neb., Washington, D.C., and Portland, Or. ), 1883 – 1909, Nebraska Woman Suffrage Association. The OHS Research Library has an extensive collection serial publications, including newspapers from around the state. Boyd, Mary Sumner, ca. 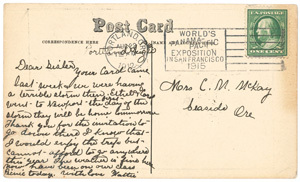 1916-1919, Mss 332. Dolph, Joseph N. papers, 1885-1894, Mss 530. Dunn, Berry Walker papers, 1875-1898, Mss 2155. Fear, Lucia S. (Drum) papers, circa 1882-1913, Mss 1550. Kronenberg, J.F., EKOMS letters to the editor of the Gold Beach Gazette, circa 1898, Mss 1553. Mitchell, John Hipple papers, 1876-1903, Mss 831. Includes 1900 letter to Gov. 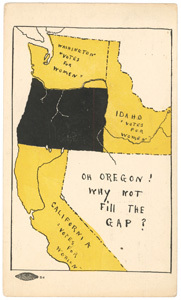 Theodore T. Geer from Abigail Scott Duniway on behalf of the Oregon State Equal Suffrage Association. Fenton, William D., Speech on Woman Suffrage—delivered Oct. 4th, 1876 in the Oregon House of Representatives, Box 2 Folder 16. Stevens, John Daniel letters, circa 1895-1930, Mss 1187.